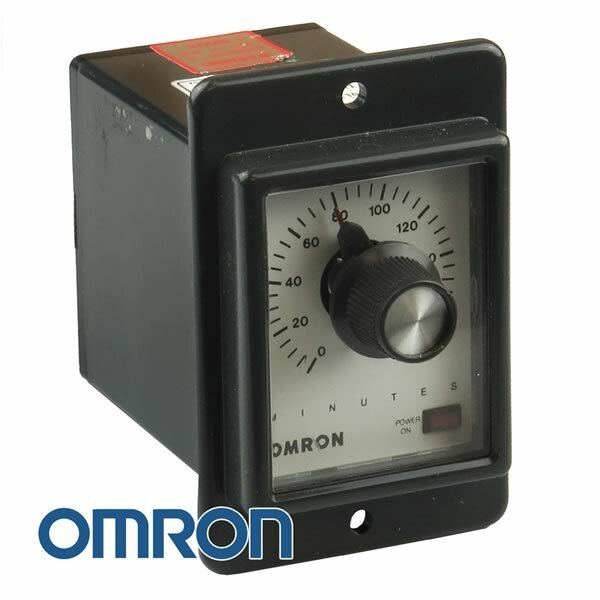 Omron deluxe adjustable time delay relay Part# STPMYDAI operates from 120VAC. Provides one instant contact closure and one time delayed contact closure. Adjustable from a knob on the front panel from 0-180 minutes. Contacts are rated 3Amp 220VAC 50/60Hz (non inductive load) or 1Amp (inductive load). Size is 3.0" x 2.4" x 2.0". Designed for panel mounting. Has 8 pin octal base (fits with our G20381 Heavy Duty Octal Relay Socket). These sell for over $100. Works with G20381 - Heavy Duty OCTAL Relay Socket (Not Included). New Old Stock (NOS).